This is place is filled with awesome history and definitely you can feel the presence of greatness. I get it why is a hallowed ground and a shrine for all Texans. There were all sort of cool stuff in there, from old timers guns to shirts and hats. We all bought something to remember the occasion. Simon got an armadillo belt buckle, which looked awesome; and the girls got scarf’s and coffee mugs; Mike and I got a hat with a quote from a famous person from the Alamo, and also coffee mugs with the celebration logo in it. We were surprised that we went through the whole thing in half a day. 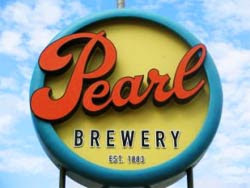 Then, Alejandra took us to the Pearl, which is a famous brewery house here in San Antonio, it has a little bit of history and also through the ages it has changed to one of those places where people meet, as in “I meet you at the Pearl”. The guys knew our love for great cosine, specially Italian. So they took us to this amazing restaurant in called Il Sogno Osteria (sogno is Italian for dream), and definitely was a dream to die for cause their food was amazing! The night was setting upon our day in San Antonio and what more can you ask but a traditional ride in the river. The River Walk is a must and more so at night! The length of the river is light up by little Mexican candles (from the far, looks like Chinese candles, so don’t tell that to a Texan or they will kill you!). what a romantic spot, and the couples were in tune with it. Simon and Jane shared one canoe, and Alejandra shared her with me, poor Mike had to ride alone. The look, the lush landscape, the winding pathway of the river makes this a must for a awesome evening. We all said that it reminded us of Xochimilco which is in Mexico! This was just the starting day in our vacation in San Antonio, definitely cant wait for what else brings the following days. In between Taquerias and Churrascos, cant wait for its succulent food and great outdoors. Maybe perhaps we can find a Linda mexicanita for Mike! But I heard Alejandra saying that one of her aunts is gonna play matchmaker and Alejandra said “Que Dios nos ampare a todos!” (meaning “May God Help us all!”).